Geneva Ramone Turquoise Mountain Turquoise Bracelet size 6 5/8"
This bracelet by Geneva is set with a free-form stone of natural, untreated Turquoise Mountain turquoise from Arizona. The stone is set in a notched bezel wrapped with twist wire. 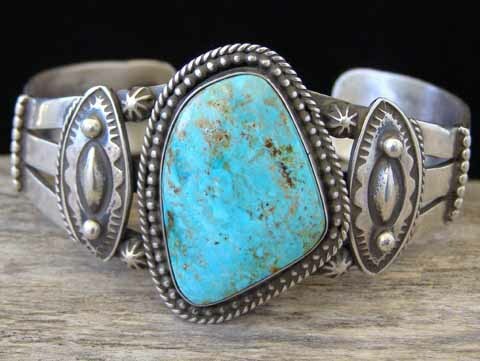 The split-shank cuff splits into three narrower bands behind the stone which is framed by appliquées and further decorated by starred buttons, raindrops and traditional stampwork. This is a very nice example of Geneva's Traditonal Revival work. This cuff was lightly rubbed with fine steel wool to take off the high polish and then it was lightly oxidized to make the nooks and crannies of the stampwork darker to heighten the contrast and give it an "old pawn" finish. Hallmarked "G Ramone" and stamped "Sterling" inside. Stone: 1 3/16" x 13/16"
Width at stone: 1 3/8"
Width of cuff on sides: 9/16"